Premium Rush is the latest movie to star Joseph Gordon-Levitt in what is perhaps the peak of his career. Having been in about four movies a year since 2008, this peak is incredibly long lasting, and has the potential to mark him as one of the most iconic actors of the decade. Of the four he’ll be in this year, this is the one that seems to stick the most closely to his roots. It’s the cheapest, uses a quirky brand of humor, and has the largest potential to surprise people due to its unique concept. His role as Officer Blake in The Dark Knight Rises, was his ascension to “giant movie action star” status, while his role in Looper and critical part in Steven Spielberg’s Lincoln have the potential to keep him in hot demand for the rest of his life. That’s all fine and fantastic but, of the four, I suspect Premium Rush is the only one that needs his presence to do well, and is thus the one we need to pay attention to the most. 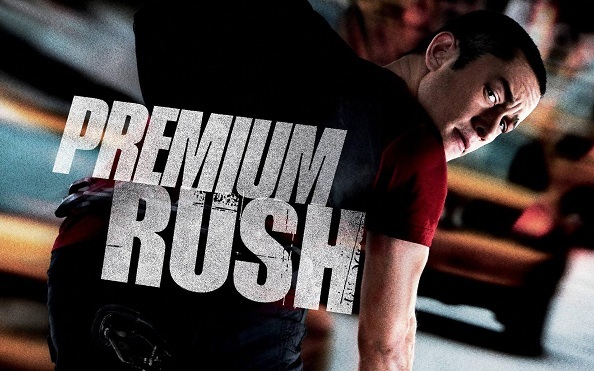 Lincoln will do well regardless of who stars in it but, without his star power, Premium Rush doesn’t have a chance. Luckily, he does well. If anything, his role in this movie has convinced me of his adaptability to any role. To some, playing a bike messenger might mean going to the gym a few times to ride a bike well enough when he’s required to (leaving a double to do the rest). To Joseph, however, playing as Wilee seems like more of chance to show off how fit he is for the role. He does most, if not all, of his own stunts, and looks like the type of guy you’d expect to see in a New York marathon. His dedication to the craft pays off during the credits, where we’re treated to a small video showing the aftermath of an incident on set where he crashed into a cab and gashed his arm open. Joseph leads a cast that acts solidly across the board with what they’re given. I say this, because the script commits the cardinal sin of having each character exist only to push him in this direction, give him that plot key, and help (or hinder) him in these ways. Any problem or subplot they have can be directly traced to Wilee in some way, making him the center of the movie’s world. As a result, they generally fade out of view despite the good amount of screen time they all get. They don’t really matter – all they do is interact with the lead. The only character that has any considerable depth to her is Nima (Jamie Chung), and even then it is a two-pronged sort of characterization. We are told she’s an Chinese immigrant in America on a student visa, and, later, that she’s trying to bring her son over from China. This is all we ever learn, and subsequently are led not to care about. After all, the only reason these things are important is because they set the plot in motion. This is not the sort of movie to focus on emotional depth – if Nima did what she did in order to pay her landlord back-rent, the movie would not change at all. What matters is how it affects Wilee. Surprisingly, this movie is written and directed by noted screenwriter David Koepp, co-writer of the first two Jurassic Park movies, as well as the first Spider-Man, and the excellent Panic Room. All of these movies, even The Lost World, have better character interactions than Premium Rush does. Even Koepp’s last film Ghost Town, did more to make the characters come alive and make it seem like they had their own things to do. I suppose this can be explained by the fact that the entire movie takes place during one afternoon, leaving little room for broad characterization. But even then, I’d expect a noted screenwriter like Koepp to make us care even in those time constraints. Now, in terms of cinematography, this movie does the best it can to make New York City look fantastic, and particularly on the streets and the people who cross them every day. It seamlessly transitions between a GPS version of Long Island and a real life view during high speed chases and accurately depicts the cramped, exhilarating feel of riding a bike on the streets through heavy traffic. The action is framed well, and there are a few impressive effects that highlight Koepp’s directing skills. However, I do not think this is meant to be the highlight of the film. I understand I gripe a lot about some things that may not matter to some people. Some moviegoers might just want to see a chase movie, and not care that the characters are as paper-thin as the messages they courier. Fans of Joseph Gordon-Levitt and bike enthusiasts who see it will have a good time. When it comes down to me, I like the idea behind this movie. It’s an interesting direction for the chase/heist genre. But it just needs more substance to make those ideas take root and to make me care.